Many of us would love to have a home that looks classy and elegant, while also having a modern touch. Most would consider getting chandeliers or big centerpieces for their tables, but for something classic yet fresh, try getting a bar globe to spice things up. Bar globes are probably not the most thought of decorating pieces, but once you find the perfect one, you’ll be glad you got it. Below are a few tips to help you choose the best bar globe for decoration. Size matters when choosing a bar globe. You don’t want to get something that’s too small or too big. You also have to consider what you’ll be placing inside the globe. Are you going to place actual long necked bottles inside or transfer the liquor or drinks into something smaller? Will you also need extra space for glasses or an area for the ice bucket? Don’t limit yourself to the regular table top bar globes and look for floor bar globes. These are much bigger so you can store a lot of things inside them. Also, it’s best to measure the globe before you buy it to make sure it’s not too big for the area. You don’t want to have something that could get in the way because it’s too big. Pick something that matches the color scheme of the whole room. Something too colorful and modern isn’t going to blend too well with a room that’s meant to look like it’s from the Victorian era. However, don’t be afraid of color. Check out a few colorful options like the Rimini Bar Globe. This is decorated with 16th century maps and its colored white. Not only is the outside of the globe designs, the inside also has colorful details to make it look extra special. You can just leave it open so you appreciate the little details on the globe. Some bar globes actually give you extra space to keep your bottles. Most of the time, the base of the bar globe has a divider installed to it so you can neatly organize your bottles under the sphere. Other bar globes also have a small table attached to the actual base itself, which makes it great for entertaining. 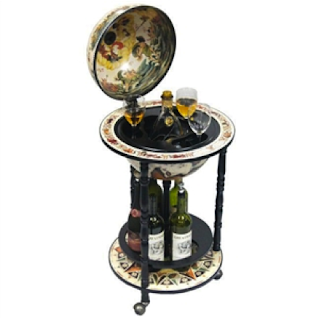 Extra space just helps you make your bar a bit more organize and you can maximize the use of your bar globe. Learn more about these great globes by visiting UltimateGlobes.com or contacting the Ultimate Globes customer support hotline. Why Choose a Decorative Gemstone Globe? When it comes to one of kind decorative pieces, a gemstone globe is the way to go. These beautiful globes are made from a number of different types of gems and precious stones. You might ask why you should get one, considering that they are a bit expensive. But gemstone globes are more than just a colorful ball. tool. Look up countries and landmarks with the globe and learn more about the world. These globes are colorful, so if you’re a visual learner, you’ll love using these globes. Since they have a lot of color, details are easily seen and differentiating different areas and boundaries will be easy. 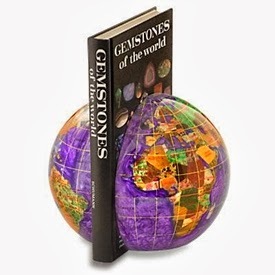 Some gemstone globes, such as the Opiate Gemstone Globe Bookends, are designed to look like the usual globe. However, you can actually pull them apart and use them as bookends or stoppers. Some gemstone globes are also used as paper weights and clocks. You can find a number of office tools designed as gemstone globes. You can give your desk and office a little color and life with these colorful globes. You can’t deny that a gemstone globe is mainly used for decorative purposes. If you’re looking for something that’s big and can be used as a center point, you can actually find gemstone globes as big as regular floor globes. Don’t limit yourself to desktop gemstone globes. Try to look for bigger globes that you can integrate as a piece of furniture, not just as a small accent to the whole design. If you want to give someone something special, something that’s different and memorable, give them a gemstone globe. Most people marvel at how beautiful these are, especially the ones that are just a few inches big. People often wonder how these are made and how the smallest details are placed on them. They’d make a wonderful gift since they can be used for a number of things and they look good as an accent. Gemstone globes are definitely unique. It can be used as a part of the décor or as a functional office tool. If you can find these at home décor stores, try going online. You can find a number of designs and sizes to choose from. 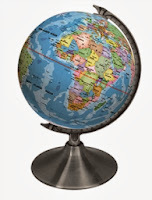 Whether you are looking to purchase a world globe for the holidays as a gift, a decor piece for the home or office, or most importantly to enhance geographic understanding, it is important to consider several things about the store you will be buying from. 1. Does the store carry inventory in its own warehouses so it can control the speed of your processing or shipment, or do they simply blind drop ship, hoping that their supplier has inventory when they need it, leaving you hanging for weeks while you await your order. This doesn't seem like a big deal, however it is estimated that over 42% of shipments that drop ship from a third party niche website do not arrive within the expected delivery period. 2. Does the store provide knowledgeable assistance on the product you are interested in buying, or do they sell 1,000s of products hoping you have what you need to make a decision? 3. Does the store use gimmicks like the one shown to lure you in, to only find out that the special offers and discounts cant be used because the manufacturers do not allow it, and they have inflated their retail to give you the sense that your getting a deal when you really aren't? Ultimate Globes is the largest distributor of World Globes in the United States and quickly growing around the world. We operate our own warehouses and stock over 95% of the items we sell with an automated order processing system. This gives us the flexibility to process orders quickly and more efficiently, getting them out the door faster than any competitor. We pride ourselves on our expertise. Our employees have all gone through extensive training on the product we sell and visit manufacturing sites each year, so they have the best information to help you make your decision on the spot. At Ultimate Globes we do not use gimmicks, we give the best price everyday on all the items we sell and we back it with a 110% price match guarantee! 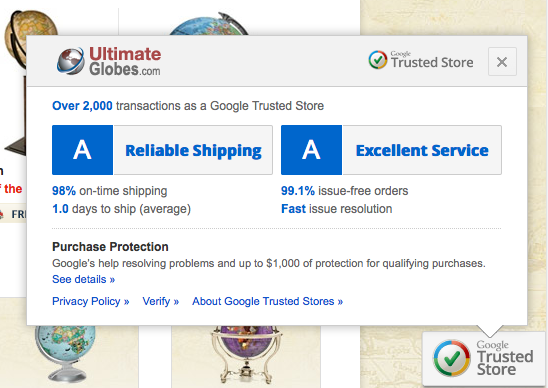 Ultimate Globes a Google Trusted Store! As a Google Trusted Store our online store is monitored by Google everyday to ensure that we continue to provide the highest level of customer satisfaction and reliable shipping. In fact we ship 95%+ of our orders within 1 business day! There are additional Benefits - FREE Purchase Protection! When you opt in for free purchase protection after your order is complete, you can feel confident in knowing that if an issue arises both Ultimate Globes and Google are here to assist. After you make a purchase from Ultimate Globes, most users have the option of opting in to purchase protection. There is no fee or charge to opt in for free purchase protection from Ultimate Globes. At this time, purchase protection is offered per-order and only at the time of purchase. Only if you opt in, you will receive an email from Google Trusted Stores confirming your purchase protection. Purchase protection covers the entire purchase amount, including tax and shipping. All of us are willing to go the extra mile to make sure your world globe meets your needs, from preorder discussion to any warranty issues that may arise down the road. Shop with confidence knowing that you are shopping with a company that can deliver on its mission! Checkout all of our globes at www.UltimateGlobes.com! Although most globes come with a sphere in the middle of a meridian and a solid base, globe makers have given many modern globes a technological makeover. Today, you can get unique globes that spin and float in mid-air. Thanks to the powers of magnets and light, gravity or levitation and self-revolving globes are now available on the market, making for great gifts for your friends and loved ones. These globes are fun and relaxing to look at. They’re great gifts if you want something different and special. Here are a few reasons to get levitating globes as gifts. Imagine having one of these little globes on your table. They don’t have any cords for electricity to make them turn, nor do they operate on batteries. You might even say it looks magical. These strange but amusing self-spinning globes, such as the Mova Globe Revolving models, are constructed in a clever manner. The actual globe is placed inside a clear container and is filled with liquid. This keeps the globe suspended, and it uses the earth’s own gravitational pull and solar energy to spin. Think of it as how a compass would work. You can pick up the globe and it would continue to spin in your hands, as long as there’s a light source available. It’s your own little world in the palm of your hands. If you want to give out a globe to someone who’s at school, then it’s best to choose one that’s a big bigger than a desk globe. Bigger globes make it easier for them to spot the different land masses and areas that they’re looking for and levitating globes can be taken off from their stands very easily. They can just take it off the base and examine the globe thoroughly. Afterwards they can just place it back on the magnetic base and it can stay suspended there till they need it again. Not sure? Need more input? Call Ultimate Globes Customer Support at 877-745-6237 ext 101 and we will be happy to assist. One of the main uses of a world globe is to work as an educational tool, providing easy-to-grasp information about the world, its topography and geography, as well as the different countries and borders men have created in it. If you're looking to buy a globe for any kind of learning institution, it can be easy to think of the task as an easy one. This, unfortunately, is not the case, as the sheer variety of world globes on the market can make it difficult to narrow down your choice. Be ready to ask questions about a world globe’s style, size, materials, features, finish, type, and more if you want to get the most out of your investment. What is The Globes Purpose? Obviously, since you're buying a globe for a school, you want it for educational purposes. As silly as it sounds, asking yourself specific questions on why you want a globe in the first place is arguably the most important thing to do before buying a globe for educational use. For instance, do you want a globe that will occupy the floor in say, a library? You'll want a floor globe for that. Do you want multiple globes in ascending sizes to line the top of your bookcases? Tabletop globes are for you then. Are your students about to study topography? Is political information (e.g. state borders, government histories) important? Or do you want globes with interactive features designed to appeal to young children, like this one below? These are crucial considerations to make because what you want the globe for easily narrows down the type of globe you'll want to buy. Other things you'll need to consider are globe type, size, color, features, and more. World globes are essentially categorized into three main types: physical globes, which provide information about the Earth’s terrain, its landscape, and ecological zones; political globes, which display state borders in prominence and use bolder colors to emphasize boundaries; and celestial globes, which display the positions of heavenly bodies in relation to the planet. Floor standing globes, the largest of the bunch, requiring plenty of space and having tall, sturdy bases to support their weight and diameter. 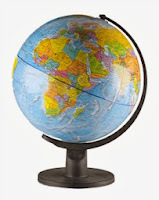 Tabletop globes, which are made to occupy desks, but are still large enough to display detailed information required in an educational setting. Desktop globes, which are smaller and gravitate towards decorative use, being too small to display a lot of information. Sometimes even once you have made your checklist it may still be a little difficult to decide on the right globe. Unfortunately it is virtually impossible to find an actual store that actually carries a variety to view. If you need assistance keep in mind that we work with hundreds of schools each month, outfitting their classroom and meeting their needs for maps and globes, so feel free to pick up the phone or send us an email and maybe there is a bit more information we can provide that will help with your purchase.